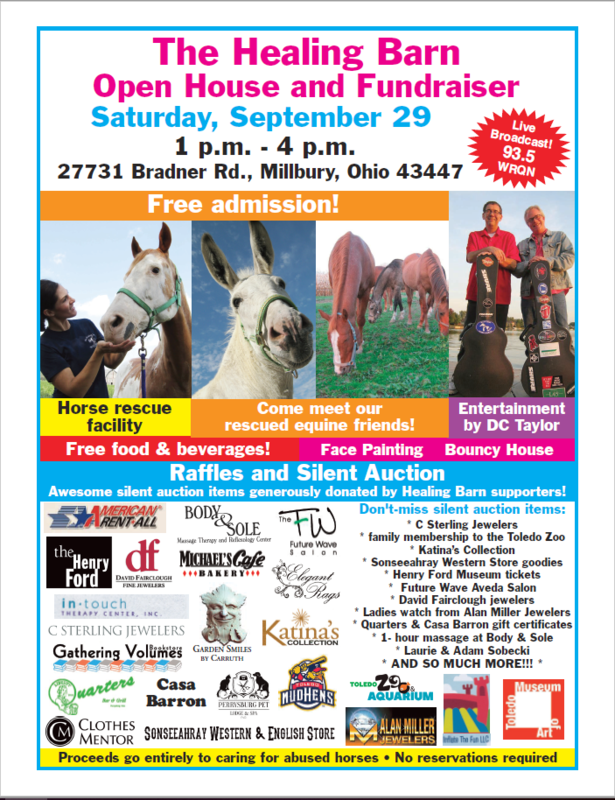 The Healing Barn Rescue – Committed to helping equine friends in need. The Healing Barn 501c3 Non- Profit Organization was started in 1999 when our family was looking for a horse for 4-H and quickly added three to the family. Two of the horses we met while looking were in need of a loving forever home. It was then we started to realize how many horses were in need in our area. We started The Healing Barn with intentions to educate and help equine owners to better care for their animals and while this is possible at times, there are cases we work closely with the local Humane Societies to remove the horses from their current situation. Once the horses are removed we work with veterinarians and natural supplements to improve the overall wellness of the animal. When possible these horses are placed into forever loving adoptive homes. In some cases, the horses have special needs that require additional daily care, therefore they stay with us to ensure their daily needs are met. In addition to rescuing, rehabilitating and rehoming the horses and donkey’s we have recently started a new program for Combat Veterans. This new program is designed to help the Combat Veterans to overcome PTSD with hands on work and interaction with our rescued horses. For more information about this grant funded program please see our Combat Veterans Application. We invite you to join our 8th ANNUAL OPEN HOUSE/FUNDRAISER SATURDAY SEPTEMBER 29TH 2018! !